As at May 22, 2017, the total amount released to participating banks since inception by the Central Bank of Nigeria (CBN) under the Commercial Agriculture Credit Scheme (CACS) amounted to N467.7 billion with Zenith Bank, United Bank for Africa and Sterling Bank emerging as top performers in the scheme. Of the total N467.7 billion disbursed in respect of 509 projects, the three banks disbursed a combined credit of N223.10 billion to deserving farmers, representing 47.7 percent of total disbursement, according to the CBN monthly economic report for the month of May 2017 seen by Businessamlive. The report indicates that Zenith Bank led other participating banks, disbursing N98.86 billion, followed by UBA (N65.56 billion) and Sterling (N58.68 billion). 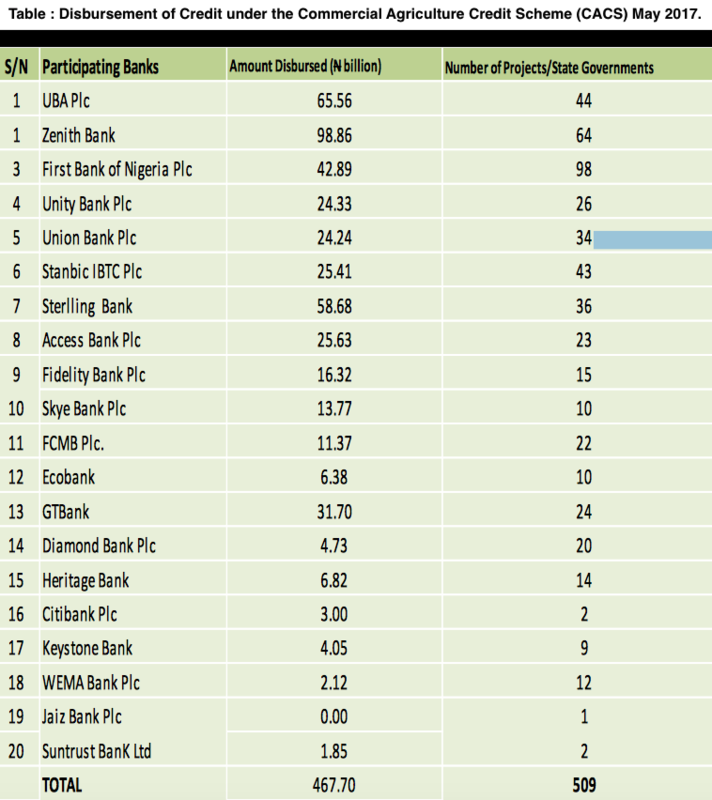 In the fourth place is First Bank Nigeria Limited with N42.89 billion. The report specifically noted that agricultural activities received a boost across the country in May 2017 as a result of the prevalent rainfall in the review period. “Activities in the Southern states were dominated by the planting of crops, while the major activities in the Northern states were the early planting of legumes and harvesting of vegetables. In the livestock sub-sector, farmers continued with the breeding of poultry and migration of cattle from the Northern states to the Southern states in search of greener pastures,” it said. The CBN also said a total of N424.6 million was guaranteed to 4,029 farmers under the Agricultural Credit Guarantee Scheme (ACGS) in the review period. The amount represented a decline of 9.6 percent and 24.4 percent below the levels in the preceding month and the corresponding period of 2016, respectively. Sub-sector analysis showed that the food crops received the largest share of N226.1 million (53.3 percent) guaranteed to 2,699 beneficiaries, livestock got N62.2 million (14.7 percent) guaranteed to 282 beneficiaries, while cash crops sub-sector received N44.4 million (10.5 percent) guaranteed to 221 beneficiaries. The mixed crops received N42.2 million (9.9 percent) guaranteed to 597 beneficiaries while N38.3 million (9.0 percent) was guaranteed to 137 beneficiaries, in the fisheries subsector, ‘others’ had N11.2 million (2.6 per cent) guaranteed to 93 beneficiaries. Analysis by the state showed that 27 states (including Abuja) benefited from the Scheme during the review month with the highest and lowest sums of N60.7 million (14.3 per cent) and N9.5 million (0.2 per cent) guaranteed to Ogun and Bayelsa states, respectively. The report equally noted that the Raw Material Research and Development Council (RMRDC) provided four (4) metric tonnes of improved cottonseeds to the National Cotton Association of Nigeria (NACOTAN) to revive the collapsing cotton, textile, and garment (CTG) sector. Similarly, the Sugar Industry received a boost with the investment of N220 billion by the Dangote Group for the establishment of two (2) sugar refineries in Nasarawa State.